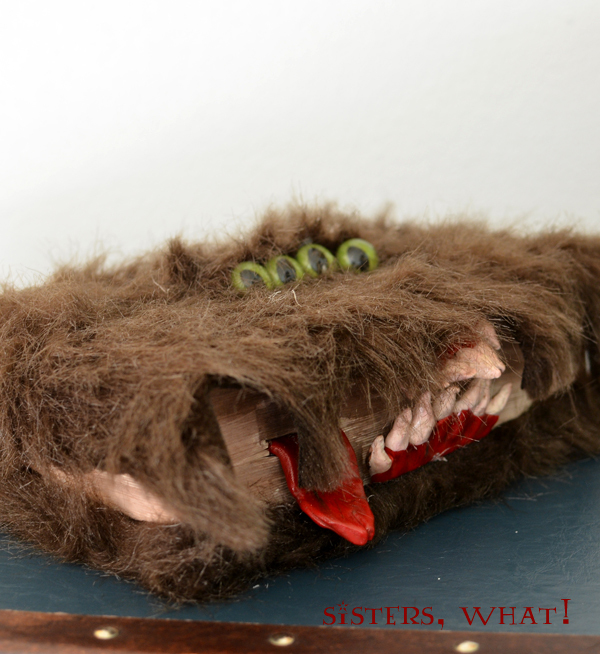 ' The Monster Book of Monsters - Harry Potter - Sisters, What! 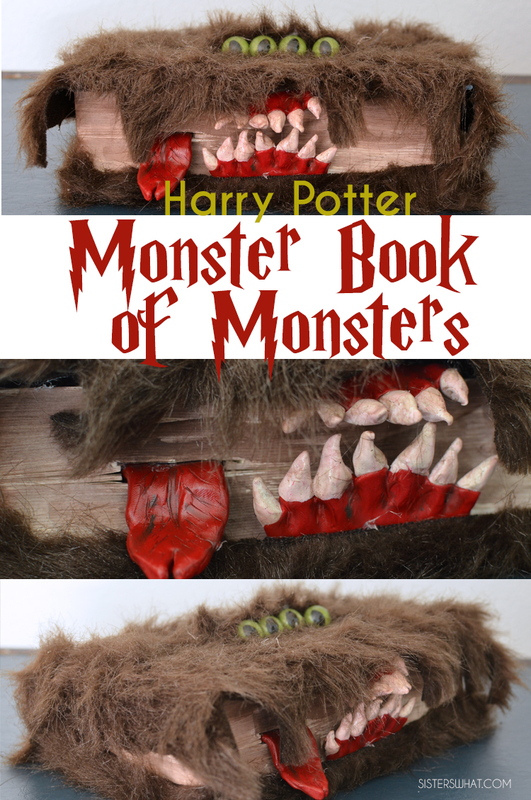 Today I had to share my recent Harry Potter creation of The Monster Book of Monsters. 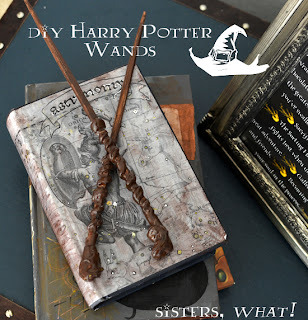 It was actually my husbands idea for a birthday present for his mother; she is a big fan of Harry Potter. I wasn't so sure she'd like it, but he was positive. So he came up with the idea and then me and Captain Awesome made it. And as it turned out she LOVED it. The best part is that it doesn't actually move or bite. Logistically that just seemed a little too complicated for me. But over all it was fairly easy to make. Especially with my 3 year old who HAD to be part of every step. An old book - I found an used Harry Potter book from goodwill. 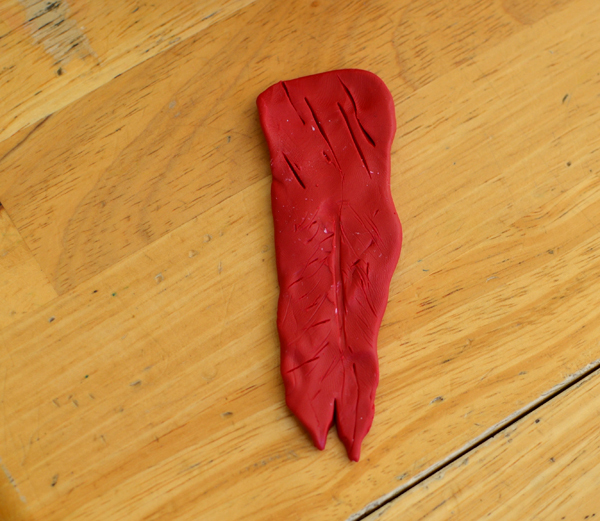 I kind of just winged this part and started sculpting the clay until it looked like a jaw. Then I added squished onto the red jaw part triangle teeth. 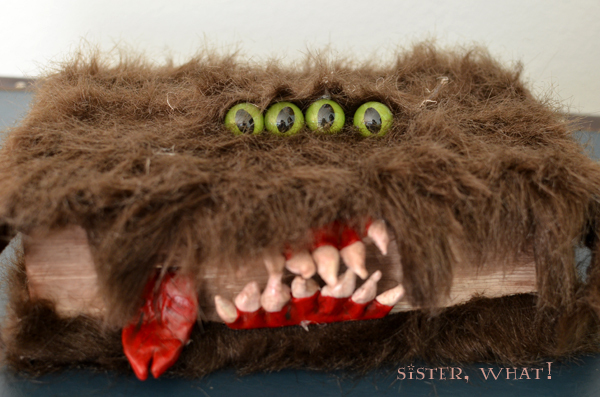 The teeth were super easy to make because they needed to look gruesome so they didn't have to be at all perfect. 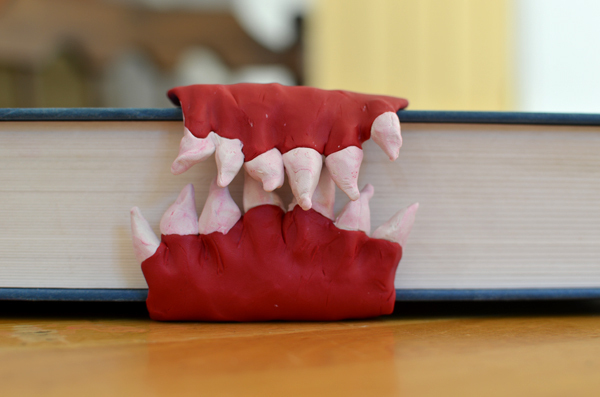 I then placed both set of teeth on the book as I would want them and then molded it in place. Then I cooked it in the oven at that shape. I then add modge podge to give it a shiny finished look. For the tongue I made it long and skinnier towards the tip. Then I split the tip so it looked snake like. I then took a knife and added a line down the middle of the tongue and some lines along side it to make it hairy like. Also place it in your book in the middle and mold it according. Then cook. After I cooked it, I placed it in the book again. I didn't like the pages sticking up so I cut a spot out of the pages so it fit in nicely. I also added modge podge to the tongue. Before placing the furry fabric on, I painted the pages with a very water downed brown paint to antique the pages a little. Then I cut my fabric so it was much bigger than the book. 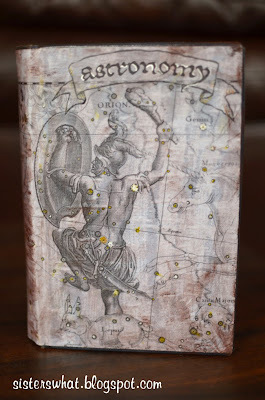 After I had it where I liked, I hot glued it to the front, back and spine of the book. I then cut the fur in the front area so it looked like tentacles. As for the eyes, I hot glued those as far into the fur as I could. That's it. 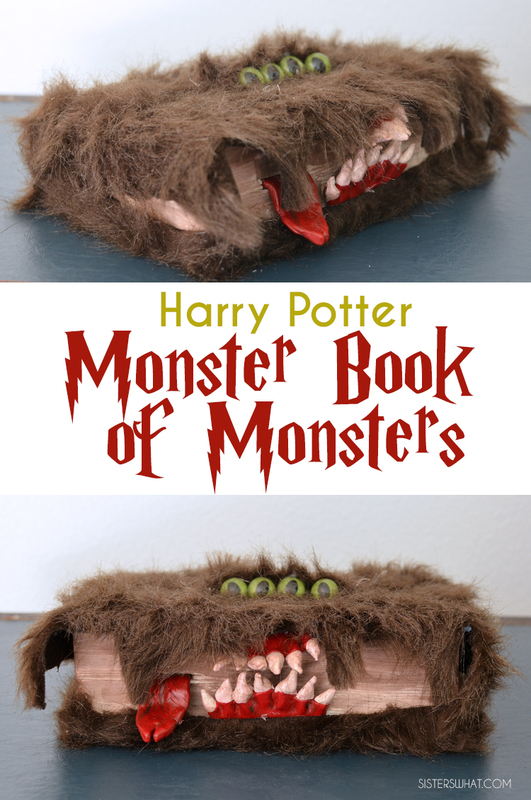 Whether you like Harry Potter or no, this book is the perfect Halloween book. Havalah, that is awesome. We had a HP party this weekend, and we missed you! I love seeing what you make. So sad to miss it : (. Miss you guys! 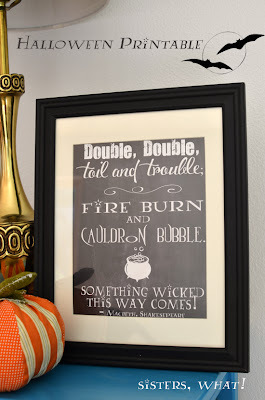 I am not a HP fan but this really is such a fun Halloween idea!! Love it! Sooooo good!! Pinning because my sister will love it!! This is great! Love all the detail you added! Thanks for linking up with us at Your Designs This Time! Sooooooo cool! Did you have to stick the book together or can it still be read? I want to make one SO badly and keep it for myself! I spent yesterday evening reading the new short essays that were released on Pottermore instead of doing the ironing! Have you seen them?